Ponteland was on the march yesterday as the community gathered for the annual Civic Service. St Mary’s Church was packed as more than 200 invited guests joined the service led by The Reverend Peter Barham, Vicar of Ponteland, supported by all the local clergy. They included politicians, local businesspeople, church leaders and representatives of a wide range of parish organisations, including charities and clubs. Morpeth Pipe Band led the parade to the church and back to the Memorial Hall, where afternoon tea was served after the service. The players were joined by the Air Training Corps, Boys’ Brigade, Girls’ Brigade and county and town councillors. 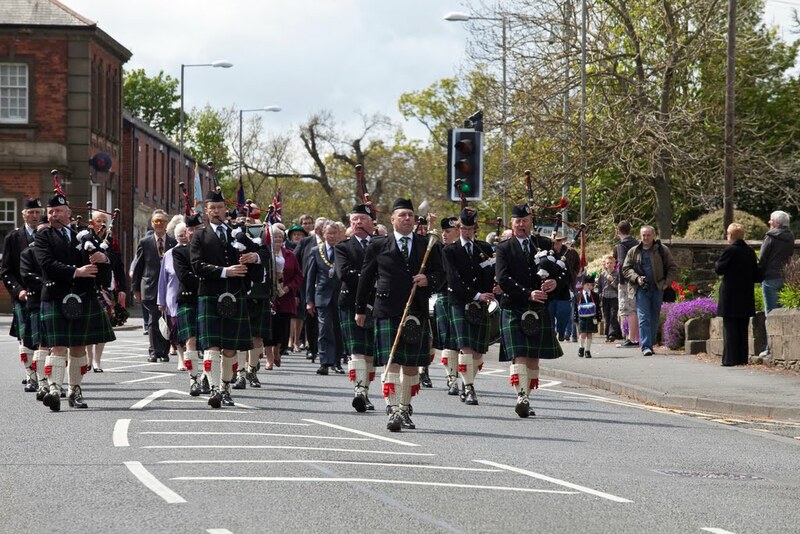 Ponteland Civic Service was launched last year to carry on a long-standing Castle Morpeth tradition following the demise of the Borough Council, which previously ran a borough-wide civic service. Town Mayor Robin Ramsay said: “The fantastic turnout yesterday – double last year’s – suggests this event is now firmly planted in the village’s annual calendar as a new tradition. “The Civic Service is one of a number of community events I want to develop as part of the Town Council’s vision of giving residents a real sense of pride in Ponteland.